Burnley edged closer to Premier League promotion with Michael Kightly's second-half goal sealing victory over relegation-threatened Blackpool. 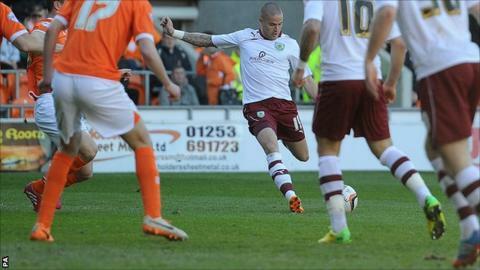 Kightly curled home from the edge of the area to seal a one-sided victory. The game was also temporarily halted after Blackpool fans threw tennis balls on to the pitch in protest against under-fire chairman Karl Oyston. Burnley will secure promotion if they defeat Wigan at home on Monday - although a draw could be enough. The Clarets might have gone up on Friday but Derby defeated Doncaster 2-0 later in the day to extend the Clarets' wait to return to the top flight, where they last played in 2010. Sean Dyche's side have an eight-point lead over the Rams with three games of the regular season remaining. So even if Burnley lose or draw on Monday, they would still be promoted if Derby failed to defeat Barnsley. Blackpool are two points above the relegation zone with three games left, although Millwall and Barnsley below them have a game in hand. In a game of few chances, Burnley had the majority of attempts but found goalkeeper Matt Gilks in decent form. Kightly had an early chance, latching on to a poor Jack Robinson back pass before seeing his shot blocked by the onrushing Gilks. Danny Ings then fired his strike from the edge of the box straight at Gilks as a poor half ended goalless. Burnley continued to press and Michael Duff side-footed a corner just wide before the breakthrough eventually came. Kightly played a neat one-two with Dean Marney on the edge of the area and curled a wonderful side-footed shot past Gilks. Blackpool then lost their discipline off the pitch as first their fans protested against Oyston by throwing hundreds of tennis balls on to the pitch to halt the game. And then, in a bizarre incident, Blackpool assistant manager Bob Malcolm was sent to the stands after shoving substitute Stephen Dobbie in the face as he prepared to come on to the pitch. Blackpool pressed for an equaliser and it very nearly came in injury time as Andy Halliday saw his late volley headed off the line by Kieran Trippier with seconds left. Blackpool caretaker boss Barry Ferguson: "The fans have got every right to demonstrate if they don't like the chairman or the board. Burnley boss Sean Dyche: ""It is another part of the business we have taken care of, it's a big result. That's 11 away (games) unbeaten and we had to work hard. "The interesting thing is Derby have changed from 'we're in the play-offs' to 'we could still beat Burnley'. "If you think of my mantra, it's never changed. Just 'one game at a time', and it's authentic. The next game comes around Monday." Match ends, Blackpool 0, Burnley 1. Second Half ends, Blackpool 0, Burnley 1. Attempt missed. Craig Cathcart (Blackpool) header from the centre of the box misses to the left. Assisted by Andrew Halliday with a cross following a corner. Corner, Blackpool. Conceded by Kieran Trippier. Attempt blocked. Andrew Halliday (Blackpool) left footed shot from outside the box is blocked. Substitution, Burnley. David Edgar replaces Danny Ings. Corner, Blackpool. Conceded by Junior Stanislas. Michael Duff (Burnley) is shown the yellow card. Anthony McMahon (Blackpool) is shown the yellow card for a bad foul. Attempt blocked. Anthony McMahon (Blackpool) right footed shot from the right side of the box is blocked. Attempt blocked. Chris Basham (Blackpool) right footed shot from a difficult angle and long range on the right is blocked. Assisted by Anthony McMahon. Andrew Halliday (Blackpool) wins a free kick on the left wing. Corner, Blackpool. Conceded by Chris Baird. Barry Ferguson (Blackpool) wins a free kick in the defensive half. Attempt blocked. Harrison McGahey (Blackpool) right footed shot from outside the box is blocked. David Jones (Burnley) is shown the yellow card for a bad foul. Louis Almond (Blackpool) wins a free kick on the right wing. Offside, Burnley. Junior Stanislas tries a through ball, but Ashley Barnes is caught offside. Substitution, Burnley. Chris Baird replaces Dean Marney. Attempt missed. Stephen Dobbie (Blackpool) right footed shot from outside the box is high and wide to the right. Assisted by Barry Ferguson. Foul by Louis Almond (Blackpool). Attempt missed. Craig Cathcart (Blackpool) header from the centre of the box misses to the right. Assisted by Barry Ferguson with a cross following a corner. Substitution, Blackpool. Stephen Dobbie replaces Isaiah Osbourne. Corner, Blackpool. Conceded by David Jones.